Algunos niños y niñas odian ver cómo se van terminando las vacaciones de verano, pero no Maritza Miramontes, quien inició el primer grado el día de hoy en la primaria Montebello Park Elementary. Martiza será una de las decenas de miles de estudiantes que regresan a clases en el Distrito Escolar Unificado de Montebello (MUSD), sin importar que el calendario indica que todavía queda un mes de vacaciones de verano. Los estudiantes del Distrito Escolar Unificado de Los Ángeles (LAUSD) regresaron a la escuela el martes. Mientras Maritza, de 7 años, se deslizaba por la resbaladilla del parque Saybrook, el pasado lunes, ella le comentó a EGP que disfrutó mucho de las actividades del parque que incluyó el dibujar perros durante sus vacaciones, pero ahora esta ansiosa de regresar a la escuela. “Quiero ver a mis amigos y jugar con ellos”, especialmente jugar con la pelota y ‘freeze tag’, indicó con una sonrisa que le cubrió todo su rostro. La pequeña no es la única persona en su familia que espera con gusto el inicio del año escolar. Su madre, Jacqueline Miramontes, también está contenta de poder tener un poco de tiempo para ella, ya que de esa forma, podrá cumplir con sus propios compromisos escolares. La madre indicó que finalmente tendrá tiempo para seguir su educación, ahora que Romeo, su hijo menor de cinco años, también va a iniciar el kínder. “Yo quería regresar a la escuela [antes de esto]”, indicó, pero teniendo dos hijos es difícil. “Con mis dos hijos en la escuela, ahora tendré más tiempo para tomar clases generales”. Miramontes indicó que el poder continuar su educación ella misma será un ejemplo para sus hijos. Esto les enseñará lo importante que es la educación en la vida, indicó, enfatizando que el siempre estar preparado es una de sus prioridades. La madre agrega que al mismo tiempo podrá hacer ejercicio y enfocarse en su salud. Otra madre de familia que también está contenta con el regreso a clases de sus hijos es Rubí Robles. Ella subrayó que tuvieron muy buenas vacaciones este verano porque con su esposo y sus dos hijos visitaron algunos balnearios, además de haber realizado otras actividades. No obstante, para muchos padres de familia que trabajan, las vacaciones pudieron ser un poco caras y complicadas porque no tienen quien les cuide a sus hijos. “Yo tuve que faltar algunos días a mi trabajo porque era difícil encontrar a alguien que cuidara a mis hijos”, dijo Rubí, quien con el regreso a clases, ya no tendrá que preocuparse porque sabe que sus hijos estarán seguros en la escuela. 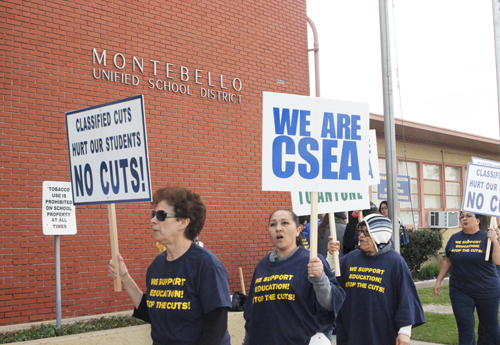 MONTEBELLO– Montebello Unified School District officials announced last week they were rescinding layoffs for the remaining 100 teachers who received a reduction-in-force notice. The announcement comes on the heels of the district rescinding 233 teacher RIF notices. Last month, 333 teachers and a number of administrators and classified staff received pink slips in an attempt to close a $17 million budget gap. Layoff notices sent out to administrators and classified staff, have yet to be rescinded. The district has been working with the Los Angeles County Office of Education to keep teachers employed. “They need to know from the onset, this district was looking for ways to keep them on the job,” MUSD Board President Lani Cupchoy said in a statement. 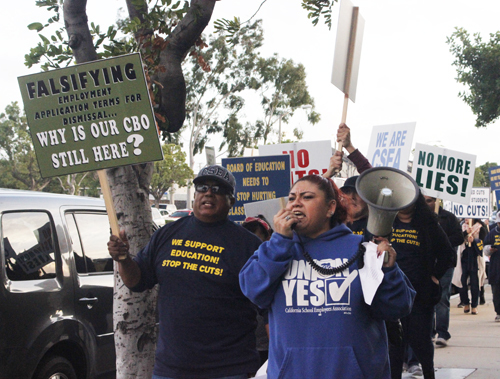 MONTEBELLO – Following months of protests from students, parents and teachers, the Montebello Unified School Board unanimously voted to rescind layoff notices for 233 of its employees. The action was approved April 6, after board members determined the district was closer to closing a $17 million budget gap. While over two-thirds of the 333 teachers, administrators and classified staff who received pink slips can now count on keeping their jobs for the 2017-2018 school year, 100 employees who received a second layoff notice late last month are still in danger of being cut. Meanwhile, activists seeking to recall MUSD Board President Lani Cupchoy and Board Member Benjamin Cardenas last week received approval from the County Registrar Recorder/County Clerk’s Office to begin collecting signatures on recall petitions. They blame the board members for the school district’s financial problems. Now that the Montebello Unified School Board has fired its controversial chief business officer, employees are hopeful a clearer, more positive picture of district’s finances will soon emerge. MUSD board members terminated Ruben Rojas last week following months of protests by employees and the public. They blamed Rojas for the district’s dire financial situation that led to 333 MUSD employees being laid off. With 235 of 333 jobs in jeopardy belonging to teachers, the Montebello Teachers Association (MTA) has the most at stake. MTA and other district unions, and MUSD officials are now scrambling to find alternatives to job cuts for closing a $17 million budget gap, but they could be running out of time. MTA President Lorraine Richards told EGP the school district must reduce spending in other areas before it lays off employees. She is especially critical of the millions of dollars spent on consultants, complaining that the expenditures have continued to increase over the years. She’s not alone; it’s a sentiment repeatedly voiced by students, parents and classified employees. “When you have a budget showing an increase for consultants of course you’ll see a red line at the bottom,” Richards said. 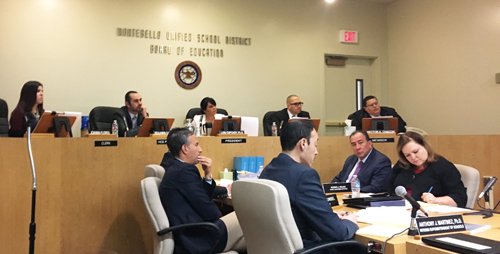 Earlier this year, the Los Angeles County Department of Education (LACOE) informed Montebello Unified officials the district is at risk of not meeting its financial obligations for the next two school years unless it takes decisive action to turn things around. To the dismay of the public, MUSD officials ultimately chose staffing cuts as the vehicle to financial solvency. Under the latest fiscal stabilization plan, MUSD plans to shore up its finances by eliminating positions, implementing furlough days, freezing pay raises and not replacing retirees. The biggest hit will be to teaching positions, with an estimated $12 million in layoffs. Administrative positions will be trimmed by $2.9 million; an additional $1.9 million in revenues will be saved through cuts to non-classroom employees. According to Richards, MTA has been studying the budget and their research has led them to other areas where revenue can be saved. In some cases, she argues, much of what is budgeted for is in fact not spent. For example, according to the latest budget summary, the cost for books and supplies has decreased by $6 million since the first interim report, based on an analysis of expenditure patterns, was released. That excess funding, however, will be used for capital expenditures associated with the district’s technology initiative. Richards hopes the district will consider offsetting general fund expenses with incoming bond revenue, to avoid personnel cuts. She proposes dipping into the school district’s rainy day reserve fund as another possible way to close the budget gap. Under state law, however, school districts are required to set aside at least 3 percent of yearly revenue in a reserve fund, and according to LACOE, it’s an obligation the district is already in danger of not meeting. Richards and others don’t believe MUSD’s finances are as dire as reported by the now fired Rojas. “A budget can be created to show what you want to show,” she says, skeptical of the financial crisis being painted. If the situation is as bad as they say, she wants to know why district officials pushed last year for voters to approve a $300 million spending bond. Rojas cited a “sparkling [outside financial credit] report” to move the bond forward, she recalls. Lloyd Garrison, president of CSEA Chapter 500, the union that represents non-classified employees like plumbers, office clerks and maintenance workers, echoes those sentiment, telling EGP the picture of a tenuous budget was not the one presented last year. Last year, after drawn out negotiations, the district agreed to award teachers a two-year pay raise and a one-time bonus. 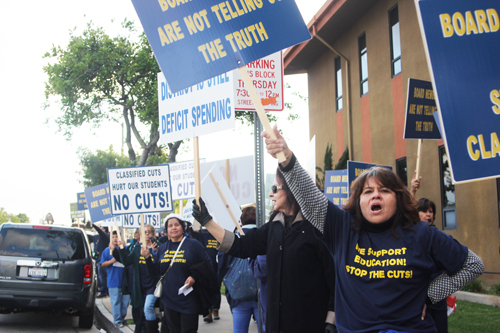 At that time, CSEA members agreed to a one-time bonus. Richards told EGP she believes the budget crisis was not brought up then because it did not exist. In the meantime, the district’s Fiscal Stabilization Ad Hoc Committee, made up of Board Members Hector Chacon and Edgar Cisneros, representative of MTA, CSEA, the Association of Montebello School Administrators (AMSA), Interim Superintendent Dr. Anthony Martinez and Director of Administrative Services Dr. Angel Gallardo, are working on identifying other areas where money can be saved or reallocated. 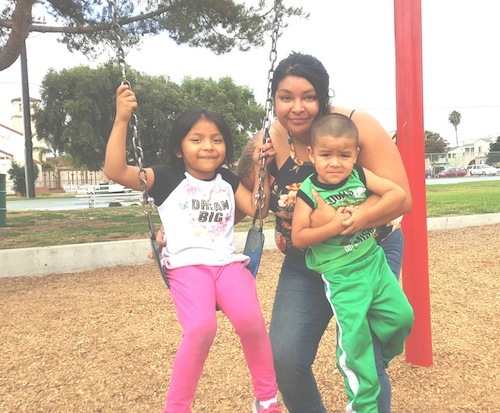 Growing up in East Los Angeles, Leticia Mendoza had teachers who encouraged her to follow her dreams; today, she is trying to do the same for young Latinas living in Southeast Los Angeles County. Mendoza, now a teacher and elected official with the ABC Unified School District, understands that even when young women are encouraged to take on the world, they sometimes do things that will prevent them from reaching their goals. “Most of the time what’s holding us back is fear,” confides Mendoza, who last week saw one of her efforts to empower young Latinas come to fruition. 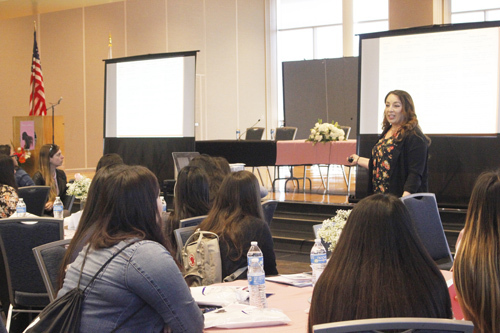 With help from local leaders, she brought together 175 high school juniors from the ABC, Downey, Montebello, Norwalk-La Mirada and Whittier Union Unified School Districts for the Inaugural Young Latinas Empowerment Conference at Cerritos College. 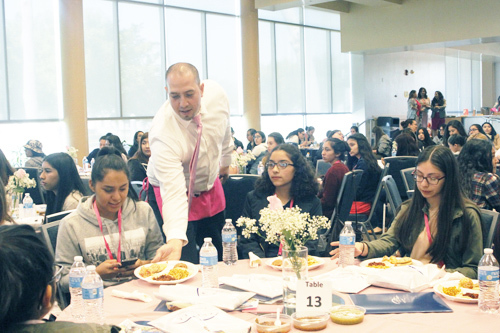 The event featured Latina politicians, businesswomen, educators, doctors and administrators who spoke to the young women about the importance of a higher education and being involved in their communities. 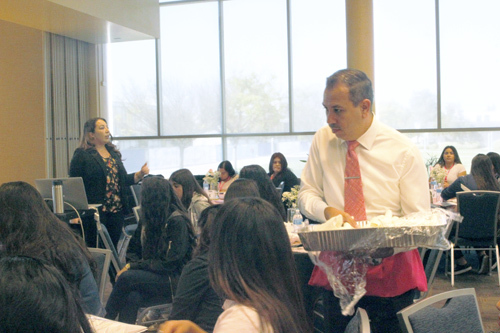 “I want these young girls to feel that no matter what field they’re interested in, it’s all up to you to get there,” said Mendoza, who also happens to be the wife of California Sen. Tony Mendoza. “Many may not be thinking about college, they face challenges and may need more encouragement,” Mendoza said, emphasizing that language barriers, immigration status, relationships, low self-esteem or college readiness can stand in their way. Or “parents may want to us to stay home and help the family,” she added, reflecting on the cultural barriers Latinas face when pursuing a higher education. 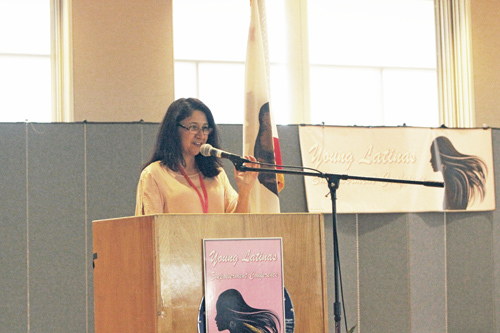 Cal State Fullerton professor Maria Malagon, Ph.D., was the featured speaker at the conference. She pointed out that of every 100 Latinos in California high schools, only 60 will end up getting a high school diploma; 11 will go on to get a Bachelors degree and three will earn a Masters degree. Even fewer end up with a Ph. D., Malagon said. She said it might not be easy once they do get to college, and at times they might not feel welcomed. There is indeed a border that sometimes separates Latinos, she acknowledged, and it’s not just the US-Mexican border we’re talking about, but a metaphorical one as well. “It’s a line that says you belong here or you don’t,” she said. “These institutions were not made for you and me…but we have the right to be there,” she said, referring to the low number of Latinos students and professors on college campuses. With the attacks on women and the Latino community by Pres. Donald Trump and his policies, a conference like this is very timely, Mendoza told EGP. “It was the perfect time to do something about it,” she said, adding she hopes more women consider running for office. Mendoza says she also wants young Latinas to know how men should treat them and that’s why she recruited her senator husband to help demonstrate that lesson. Wearing pink aprons, a dozen male elected officials took “serving the public” literally. 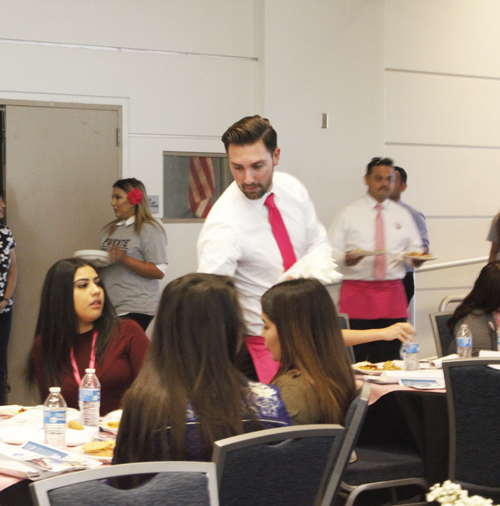 Commerce Mayor Ivan Altamirano and MUSD Board Member Edgar Cisneros were among the officials who served lunch to the young Latinas. “We wanted to show you we care about your success,” Sen. Mendoza told them. Many of the high school students used the word “empowered” to describe how they felt after hearing the words of encouragement from speakers and seeing women that look like them in important professional fields. Sara Flores, a junior at Santa Fe High School, told EGP she felt more motivated to reach her goals. Norwalk High School student Lizet Anguiano was quick to put her newfound confidence and authority into action. Nearly 500 Montebello Unified School District employees will receive pink slips as part of plan to deal with the district’s multi-million dollar budget deficit. Under intense pressure from workers and the public, the Montebello Unified school board earlier in the month postponed voting on a recommendation to cut 319 jobs, saying they wanted more time to look for other solutions to the district’s looming financial crisis. The decision to cut even more positions left many questioning why in less than two weeks the number of jobs slated for cuts grew by nearly 150. “Looks like soon we’ll all be getting laid off,” said a disappointed Lisa Dominguez following the board’s vote at its Feb. 16 meeting. Although Dominguez’s job title is not listed on the approved resolutions, as a longtime senior office assistant and member of the California State Employees Association, she knows many of the classified employees who could find themselves without a job come fall. Montebello Unified is under intense pressure to close an estimated $17 million budget deficit or risk the Los Angeles County Office of Education (LACOE) sending in someone to oversee district finances. For nearly three hours, speakers pleaded with school board members to save their jobs, but in the end the board voted 4-1 to approve laying off classified and non-classified employees ­­– including plumbers, attendance technicians, custodians and administrators on special assignment. Tom Callison, a district carpenter, said he was not surprised by the board’s decision, but was dis-appointed in the way they handled the situation. “I thought they should have at least apologized for what they had to do,” Callison complained. The board’s action met LACOE’s Feb. 17 deadline to submit a fiscal stabilization plan and the ap-proval of corresponding resolutions, while at the same time complying with its March 15 deadline to notify impacted employees as required in bargaining unit agreements. “Because of the actions you’re taking tonight we no longer feel it necessary to put a fiscal advisor” at the district, said LACOE’s Chief Financial Officer Dr. Scott Price. Price said their team of fiscal experts would still provide the district with advice, but would not have the same powers as a fiscal advisor to rescind district decisions. MUSD employees on the other hand were not as impressed. “Recall” was heard soon after the gavel hit making the layoffs official. CSEA Chapter 505 President Lloyd Garrison told union members to not give up hope that every job would be saved. Employees do not plan to wait until the November election to fight back, Garrison told EGP. Marisol Rivera, a school secretary and CSEA regional representative said employees plan to take their outrage to their neighbors. “We need to make those phone calls and knock on doors to let them know what is going on in their backyard,” she said. In the meantime, employees say they welcome the county and state looking into district finances. They hope they will uncover alleged financial discrepancies and to oust Chief Financial Officer Ruben Rojas, who they claim falsified information on his resume and job application. Board Member Hector Chacon, the lone vote against the cuts is up for reelection in November. He too blames Rojas for the district’s current financial woes. “There should only be one layoff,” Chacon said, referring to Rojas. For many employees, their last hope is Superintendent Anthony J. Martinez, who they have been calling on to “do the right thing” and to put Rojas on leave while accusations against him are investigated. “Why not take the time … if the allegations are not true, provide that proof to the public,” Callison said. Chacon said he does not trust the budget presented by Rojas, especially since the deficit grew from $15 million at the last school board meeting to $17 million now. Price said such increases aren’t unusual, explaining that earlier numbers were based on what the district expected to receive before the governor released his annual budget. CSEA Labor Relations Representative Simon Rea called out Rojas for his contradictory statements over the severity of the district’s financial situation. “It doesn’t add up,” he said. Citing a previous article by Eastern Group Publications [publisher of this newspaper], Rea read a statement by Rojas highlighting the “strong fiscal management of the district” that has resulted in Montebello Unified’s $100 million voter-approved school bond receiving a AAA rating from the Fitch Ratings Agency. Board Member Ben Cardenas stressed the board made a sincere attempt to avoid layoffs and to buy a little more time. “Given the current timeline we came up with fiscal scenarios to ensure we minimized layoffs, especially in the classroom,” Cardenas said. With the help of the county’s fiscal experts, he said they might be able to rescind many of the pink slips going out by the end of the fiscal year. By approving the layoffs, there’s less urgency to save jobs, countered Chacon. Raphael Ramirez, one of four plumbers in the district and number 29 on the list of layoffs, warned the board that cutting their jobs will have a major impact on students. “Nobody thinks about how water comes out of the faucet, until it doesn’t,” he said. Update: Feb. 24, 2017 10:45 a.m. clarified original statement that Lisa Dominguez’ job was not in jeopardy. 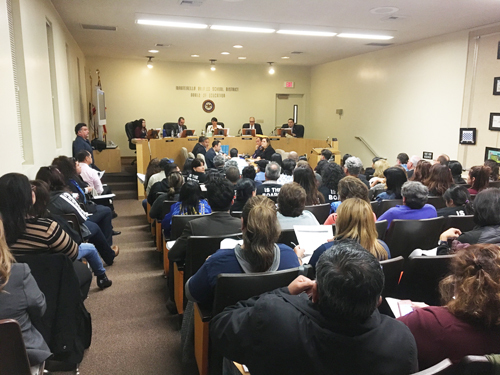 Custodians, bus drivers, secretaries and cafeteria workers in the Montebello Unified School District (MUSD) successfully persuaded school board members to temporarily delay action on proposed job cuts and to try to find another away around the district’s looming budget crisis. “We are the ones at schools before the class lights come on and the ones there way after the lights go off,” Marisol Rivera, a school secretary and regional representative with the California School Employees Association (CSEA) Chapter 505, told EGP during a raucous protest rally before the Jan.19 school board meeting. MUSD is facing a $15 million budget deficit next year and district staff proposed laying-off 319 certificated administrators and classified – or non-teaching – employees to save money. The proposal comes following notification by the Los Angels County Office of Education (LACOE) that its analysis of MUSD’s finances concluded the school district is in danger of not meeting its financial obligations for the next two school years. They gave the district until Feb. 17 to submit a detailed fiscal stabilization plan or risk the county sending in an overseer. MUSD must identify $15 million in cuts for the 2017-18 school year and an additional $16.4 million for 2018-19, without touching a penny from its reserve account that has fallen just below the state-mandated 3 percent minimum saving requirement. News of the potential cuts did not sit well with the approximately 100 employees, parents and some alumni at the protest rally before last week’s board meeting where the layoffs were on the agenda. “I’m here to put a face to a name on that list,” 54-year-old attendance and pupil data coordinator, Rene Infusino, told board members. Infusino’s husband Marcello, 57, has worked for the district for nearly 40 years and is currently the print shop operations coordinator. Ironically, he printed the very agenda that called for eliminating his position. “You’re wiping out an entire family,” he said, pleading with board members to save his job. He and his wife both losing their jobs would be a huge hardship, Marcello told EGP, explaining he has a mortgage and student loans to pay and two children in college. During the 2010-2011 school year, MUSD had $44 million in reserves. The fund has since dwindled to less than $10 million. “Where did all the money go?” demanded Jerry Perez, a district bus driver. “Why don’t the higher ups get cuts?” he said, punctuating the view of many at the meeting. Perez, still wearing his uniform, told EGP he blames the board and Chief Business Officer Ruben Rojas for the district’s financial mess. The worker’s union, CSEA, has passed a “vote of no confidence” in Rojas and accused him of hiring personal acquaintances, lowering district morale and pushing through questionable and expensive labor contracts and falsifying documents on his job application. “How is it that he’s still employed while our people are getting cut,” said Rivera in disbelief. Rivera says cutting classified workers will hurt students. “We are the maintenance workers that make sure the AC works, the bus drivers that get them to school, the clerical [workers] that deal with parents and the health assistants that handle sick children,” she said. CSEA Labor Relations Representative Simon Rea disputes district claims of having less money due to falling enrollment, saying revenue has actually increased in recent years. He suggested MUSD take a closer look at its professional consulting services and other higher paid positions instead of classified staff, who he says are underpaid and overworked, comparing them to the oil that keeps the parts of a car from breaking down. LACOE Chief Financial Officer Scott Price reminded the board that MUSD has been living beyond its means for years, refusing to make cuts despite warnings from the county about its structural deficit. “If you keep going in the same direction you are going to reach zero percent [of reserves] by the end of next year,” Price warned. Board Member Ben Cardenas asked Price if it seemed plausible the district could find a fiscal solution not requiring layoffs. “I do not see how you can do that without making cuts in personnel,” responded Price. “Cuts have always been the last resort, not the first resort,” Chacon said before asking his colleagues to continue the item until the Feb.16 meeting to give the board time to exhaust all other options. He suggested the district consider borrowing money to avoid layoffs, take a closer look at contracts proposed by Rojas, freeze promotions, ask unions to consider a 2 percent pay cut and even proposed MUSD sell off its district headquarters and move their offices to the Laguna Nueva School site. Others suggested furlough days. While many in the audience were pleased to hear Chacon say he would not support cuts, they were also frustrated that Chacon, who’s been on the board for decades and is up for reelection, failed to act on past opportunities to prevent the fiscal fallout facing the district today. “They should have done that years ago,” someone in the audience said. “He is all talk,” said another. If the school board ultimately approves layoffs, the district must deliver pink slips to impacted employees by March 15 to comply with the terms of agreements with its bargaining units. “Is it possible we come up with multiple scenarios? Yes, it is possible will we find these in the prescribed time, that’s open to interpretation,” said Cardenas. If the district fails to adopt a plan to stabilize its finances, the county is likely to send in a fiscal advisor to ensure steps are taken to shore up MUSD’s budget. The prospect of county oversight – particularly over spending – appealed to many in the audience who had complained about Rojas. In response to those complaints, Chacon asked staff to include on the board’s next meeting agenda discussion of whether Rojas should be placed on paid administrative leave while claims against him are investigated. The district began hosting informational meetings on their fiscal stabilization plan Wednesday and will hold three more meetings over the next two weeks. Over 300 Montebello Unified School District jobs on the chopping block were saved at least for now as district officials try to come up with a plan to make up a $16 million budget deficit. “Jobs were temporarily saved tonight but we’re not holding our breath,” Marisol Rivera, a school secretary and regional representative for the California School Employees Association (CSEA) Chapter 505, told EGP following the vote during Thursday’s MUSD school board meeting. Sporting union shirts and gripping signs that read, “Recall the MUSD Board” and “NO CUTS!,” hundreds of CSEA members, from custodians and bus drivers to attendance technicians and cafeteria workers, protested outside district headquarters before the meeting to demand board members vote down a cost-cutting plan that would have laid off 316 district employees. The proposed layoffs follow a notice from the Los Angels County Office of Education (LACOE) informing the district that it might not meet its financial obligations for the next two school years according to their analysis of the district’s finances. The district must now identify $15 million in cuts for the 2017-18 school year and an additional $16.4 million for 2018-19, without touching a penny from its reserve account that has fallen just shy of meeting the state-mandated 3 percent minimum saving requirement. “Without full implementation of the proposed cost reductions, the district’s ability to maintain the minimum reserve requirements and its fiscal solvency may be severely impacted beginning with 2017-18,” LACOE’s Chief Financial Officer Scott Price advised the district in his letter. Citing a lack of funds, district staff proposed laying off 316 certificated administrators and classified – or non-teaching positions –saving the district millions of dollars. Marcel Infusino, 57, and his wife Rene, 54, are two of the employees who could lose their job if those cuts are made. Infusino has worked for the district for nearly 40 years and currently works as the district’s print shop operations coordinator, where for the last 12 years he has been in charge of printing school board meeting agendas and other district-wide tasks. Ironically, he says he had to print the agenda that called for his positions to be eliminated. “You’re wiping out an entire family,” he pleaded with the board Thursday. “We’re just not ready to retire,” his wife lamented. “Cuts have always been the last resort, not the first resort,” Chacon said before asking his colleagues to continue the item until the board exhausts all other options. Many in the audience, including district alumni who turned out to the meeting, were pleased to see Chacon would not support cuts, but some also expressed frustration that the longest sitting member of the board member had failed to act on past opportunities to take action to prevent the fiscal fallout facing the district today. Now, working under a time crunch, the board only has until Feb. 17 to submit a detailed fiscal stabilization plan to LACOE, just one day after its next board meeting. If they ultimately approve layoffs, the district agreements must deliver pink slips to impacted employees by March 15 in order to comply with the terms of its agreements with bargaining units. Price reminded MUSD board members and staff Thursday that the county has been warning the district for years that they were operating on a structural deficit. If the district fails to adopt a plan to stabilize its finances, the county is likely to send in a fiscal advisor who would be tasked with ensuring the district takes the steps needed to shore up its budget. 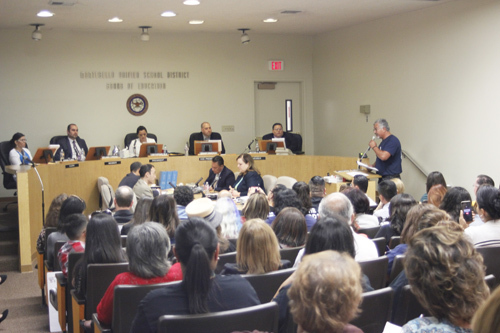 The prospect of county oversight – particularly over spending – appealed to many in the audience who had complained about the performance of MUSD’s Chief Business Officer, Ruben Rojas. CSEA earlier this year passed a “vote of no confidence” in Rojas, accusing him of hiring personal acquaintances, lowering district morale and not adhering to project labor agreements among other issues. Union members and others recently accused Rojas of falsifying documents on his job application, growing increasingly angry that there’s been no action by board members on their charges, allowing Rojas to keep his job while union members are on the verge of losing their livelihood. Chacon responded to their complaints by asking staff to include on the board’s next meeting agenda discussion of whether Rojas should be placed on paid administrative leave while claims against him are investigated. The district will host informational meetings on their fiscal stabilization plan for the next two weeks beginning on Wednesday. 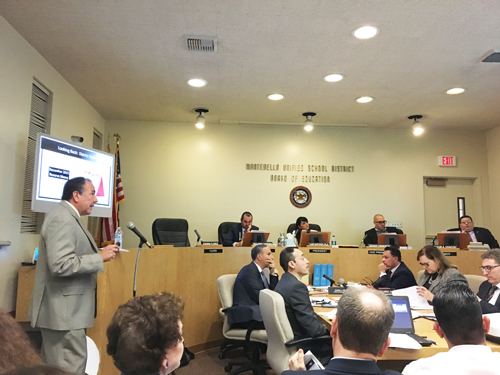 County education officials have notified the Montebello Unified School District that it might not meet its financial obligations for the next two school years unless the District implements budget cuts and takes action to stabilize its finances. MUSD is facing tough fiscal realities and challenges, according to the Los Angeles County Office of Education, which advised school officials they must take steps to restore and maintain the minimum reserve for the 2017-18 and 2018-19 school years as required by law. MUSD has agreed to move forward with an “aggressive” fiscal stabilization plan with “minimal disruption to the classroom” in response to the LACOE’s analysis, the District said in a written statement. “MUSD is facing the same kind of funding challenges that are currently impacting numerous districts across the state, including declining enrollment, increasing retirement pension costs, rising health benefit costs for current employees and retirees,” Cardenas said, adding that the expiration of one-time mandated block grant funding and underfunding of special education are also been a factor. The District serves more than 64,000 students in grades K-12 and adult education programs in Bell Gardens, Montebello, Commerce, Monterey Park, East Los Angeles and Pico Rivera. Declining enrollment due to lower birth rates in the area and families enrolling their children in neighboring districts has been an ongoing issue for the MUSD. MUSD plans to host informational sessions on the school board’s proposal next week where they will take questions from parents, employees and stakeholders. Last month, board members approved a forensic audit of the district’s finances, which they said would help them better understand MUSD’s financial protocols, policies and procedures. “Our decision today will put in place programs and procedures that will shield our students from any efforts to determine their legal status, sexual orientation and other forms of personal information,” said MUSD Boardmember Ben Cardenas. With President-elect Donald Trump’s inauguration approaching, many are worried he will follow through with his promise to deport millions of undocumented immigrants. MUSD serves the cities of Bell Gardens, Commerce, Montebello and portions of East Los Angeles, Monterey Park and Pico Rivera – all home to large immigrant populations. The threat of deportation and potential separation from one or both parents, or other family members “can have a chilling effect on a child, create undue stress and impact a child’s ability to concentrate in the classroom,” Cardenas said. The declaration will allow the District to protect data and the identities of students, family members or school employees from disclosure to federal agencies for purposes not related to education. Under the newly adopted sanctuary, safe zone designation, District personnel will be prohibited from asking students about their immigration status or participating in any other immigration enforcement effort. The District will also create an educational equality advisory committee to to consider the impacts immigration issues and policies will have on the district. “The district must always strive to combat racism, sexism and other forms of bias and assume a responsibility to provide equal educational opportunity to all students,” said MUSD Board President Lani Cupchoy during the Dec.15 meeting when the action was taken. Under the Plyler V. Doe Supreme Court ruling, state and local governments are prohibited from excluding undocumented children from obtaining a free public education. The “safe zone” will also protect LGBTQ communities, women, political minorities and others. “Beyond education, our students and families need to know that the district is also fighting for their constitutional rights and their quality of life,” Flores said.